John Wall believes the Washington Wizards have the opportunity to emerge as one of the top teams in the Eastern Conference now that LeBron James is in the West. The Wizards are coming off a season in which they finished 43-39 and eighth in the East, barely making it to the playoffs. Washington were 16 wins behind the top-seeded Toronto Raptors, 12 adrift of the Boston Celtics and nine back from the Philadelphia 76ers. 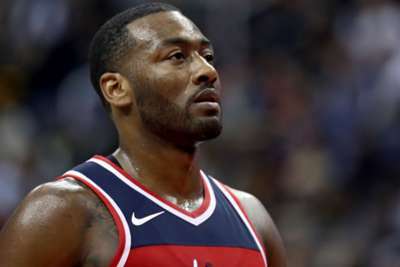 But with James leaving the Cavaliers to suit up for the Los Angeles Lakers, Wall thinks the Wizards can challenge for a much higher spot this season. "I feel like we're all equal," Wall told Yahoo Sports. "None of them won a championship. This is no knock on no other team. Don't get me wrong. "Boston is a hell of a team. Philly has great young talent with those guys [Joel] Embiid, [Ben] Simmons. And Toronto, losing DeMar [DeRozan], they still get Kawhi [Leonard]. "Y'all might have been to the Eastern Conference finals, where we haven't been to, but none of y'all were going to the Finals. It was one guy going to the Finals. Ain't nobody separated from nothing. "I know one guy that separated himself from the Eastern Conference every year, and that was LeBron James and the Cavs. Other than that … if you lose in the second round, or the conference finals, you still didn't get to your ultimate goal."